Beamafilm is Australia’s premium movie streaming channel for true stories and independent voices. The collection has been carefully curated to contain more than 500 award-winning documentaries, independent features and festival favourites to delight, inspire and entertain you. New titles are added every month. Log in with your library card number and email address. Beamafilm works on many devices, including phones, tablets, and your home computer system (PC or Mac). You can view on your TV screen by connecting your TV to your computer or device via Apple TV, HDMI cable, or Chromecast. Every Beamafilm title is hosted in multiple renditions, and only the appropriate version is sent to you based on your internet connection speed. If you have a very low internet connection speed you may experience buffering or else a low res version of the film may be sent to you. 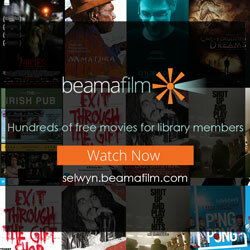 More information is available on the Beamafilm site once you have logged in.